I absolutely adore blueberry season and I’m so happy that it’s finally arrived here in our neck of the woods. I love blueberries so much that I spend extra time during the month of August picking as many pounds as I can so that we can freeze some for winter. Nothing like farm fresh blueberry pancakes in January! Anyhow, these blueberry muffins are a new favorite. They’re sweetened with honey and are extra moist from a healthy amount of yogurt added to the batter. The touch of cardamom is a wonderful addition and all of the flavors blend together and create a unique twist on an old classic. Also–I learned a valuable tip for keeping berries from sinking to the bottom of the muffin tins (which always happens to me) if you toss the berries with 1 teaspoon of flour before adding them to the batter it will keep them from sinking. How have I never known that? Anyhow, I hope you all enjoy these tasty treats as much as we do. They’re absolutely wonderful first thing in the morning heated up with a smear of good quality butter and a drizzle of extra honey. Pair with a cup of coffee and you’re all set to tackle whatever the day has in store for you. Preheat the oven to 350F. Grease a standard 12 cup muffin tin and set it aside. In a large mixing bowl, combine 1 ¾ cups of the flour with the baking powder, baking soda, salt and cardamom. Mix them together with a whisk. In a medium mixing bowl, combine the butter and honey and beat together with a whisk. Add the eggs and whisk well. Stir in the yogurt and vanilla. Pour the wet ingredients into the dry and mix until just until combined (a few lumps are ok). In a small bowl, toss the blueberries with the remaining 1 teaspoon flour. Gently fold the blueberries into the batter. Divide the batter evenly between the 12 muffin cups. Sprinkle the tops of the muffins with turbinado sugar. Bake the muffins for 22 to 24 minutes, or until the muffins are golden on top and a toothpick inserted into a muffin comes out clean. Cool for a few minutes in the pan and then use a butter knife to gently loosen the muffins and let them cool completely on a wire rack. These look delicious! Do you think that I could substitute coconut oil for the butter? These muffins look so yum…I love your blog/recipes and always look forward to updates from your beautiful badass farm! I’m wondering, do you think Bob’s Red mill whole spelt flour would work in this recipe, or do I have to use pastry flour? Thanks so much! I think whole spelt flour will work just fine here. Happy baking! These sound delicious, but I’m afraid I’d have to add a protein source to the meal for them to make a good meal. I really like the idea of cardamom with blueberries. i wonder if adding hemp powder or hemp seeds would increase the protein from the eggs to help create closer to a serving, or one could make strawberry hemp milk to go with! (which would add fiber, vit c and protein! These are baking in my own converted to GF right now, we will see how they turn out. This blog is beautiful! Love the idea of using Cardamom. I’m def going to try that. Cheers! Made these this morning!! Couldn’t wait 🙂 The amount of cardamom was perfect. I ended up using oat flour and almond flour because that’s what I had on hand. The muffins didn’t rise too much but I expected that. I also added in collagen powder for an extra protein boost! Made these last night. 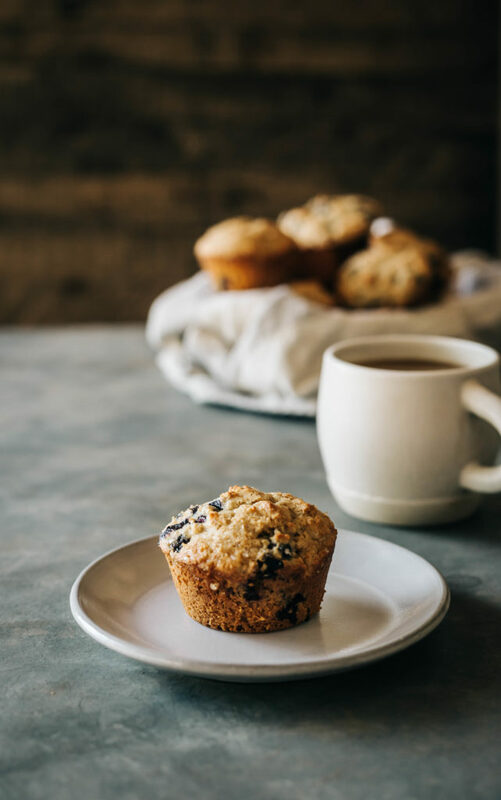 Love the smooth consistency and the cardamom flavor which is not overpowering but subtle enough to give it a different taste to blueberry muffins. Also added in blackberries. Thank you! so happy to hear you loved them too! I made these today – they are SO GOOD. Thank you! These were delicious! Not too sweet and very easy to make. Great ingredients and perfect from breakfast.